How to Uninstall Betternet on Windows? Home »	Uninstall » How to Uninstall Betternet on Windows? Issue: How to Uninstall Betternet on Windows? Please provide Betternet removal tutorial on Windows OS. Thanks!! How to Uninstall Betternet on Windows OS? It’s not a secret that PC users face various privacy and security-related issues while browsing on the Internet. Therefore, apps such Betternet are getting increasingly popular. This tool secures user’s Internet connection by changing IP address, location, and other data. On top of that, it enables access to block websites, disables firewalls, and even provides access to music/movie channels. Sound good to be true, isn’t it? 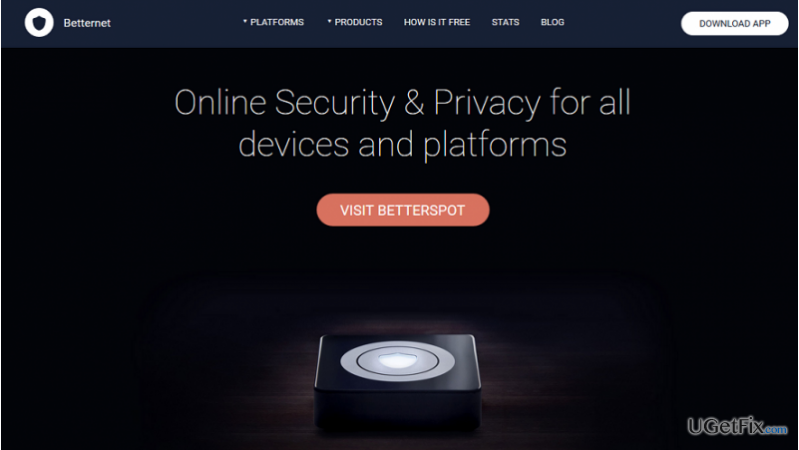 Betternet has been developed by Betternet Technologies. It’s a worldwide spread tool, so naturally, users are divided into two groups, i.e. those who love it and those who don’t. If you belong to the first group, then this article is not for you. If, however, this application is not for you, then you have to read the rest of this post because we will explain all the peculiarities related to full Betternet removal. Experts point out that Betternet software can cause some problems related to removal, re-installation, difficulties in detecting leftovers, freezes, and crashes. It’s obvious that you are experiencing one of the problems – removal. The rest of the side effects may not occur, but if they would, you should uninstall Betternet on Windows without a delay. Before you start, note the fact that Betternet software installs two other programs alongside, i.e. OpenVPN and TAP-Windows. The majority of users don’t suspect about such additional installers, so, it goes without saying, that they are not thinking about their removal. Thus, if you uninstall Betternet, but leave the other two apps, Windows system gets packed with useless apps. So, to get rid of Betternet ultimately, you have to uninstall OpenVPN and TAP-Windows along with. You will need some time to deal with three applications, don’t you? If you want to shorten the time of Betternet removal, our recommendation would be to do that automatically. For that, download Perfect Uninstaller and launch it. Once the computer is ready to use, open Start menu by clicking the Windows logo in the bottom-left corner of the screen. Then go to Control Panel -> Uninstall a Program. In the list of programs, find Betternet, click on it and select Uninstall. If a confirmation window asking whether you want to restart your computer now or later appears, click on Later/No. Open Start menu again, type regedit and hit Enter key. When Windows Registry Editor opens, locate HKEY_CURRENT_USER/Software/ folder and find a folder that belongs to Betternet. Delete them by right-clicking on it and selecting Delete. Move the cursor to the bottom right corner of the screen to open charms bar. Click Search and then type msconfig. Press Enter key, then click on Boot tab, select Safe boot option (in the Boot options section) and then click OK.
Again, move your cursor to the bottom left corner of the screen to open charms bar. Click Search, type in: control panel and hit Enter key. Then select Uninstall a Program in the Programs column. In the list of all programs that are installed on your computer, find Betternet, select it and click Uninstall. Refuse to reboot your computer immediately by selecting Later/No option. As we have explained above, open charms bar again. Select Search, type regedit and press Enter Key. Locate where HKEY_CURRENT_USER/Software folder is, and delete Betternet folder. To do that, right-click on it and select Delete. In the list of programs, find Betternet, right-click on it and select Uninstall. The you will be redirected to Control Panel. Click on the Betternet again and select Uninstall. If a confirmation window shows up asking if you really want to uninstall Betternet, click Yes. NOTE: you should perform the same steps for OpenVPN and TAP-Windows removal. Finally, when you perform the steps listed above and reboot the system, open Task Manager and check if Betternet and its counterparts are running. If they are not, it means that the removal process was successful. If you are not willing to spend so much time uninstalling Betternet on Windows, then Perfect Uninstaller is here for you. It’s an easy-to-use removal tool that will delete all unwanted programs and their leftovers with one click.